Most ballots have probably already been cast, but here's some thinking for posterity at least. Also, if you haven't cast your ballot yet, remember to vote. Normally I wouldn't agree with anti tax signs that are out in fields in the county, but this one I agree with. 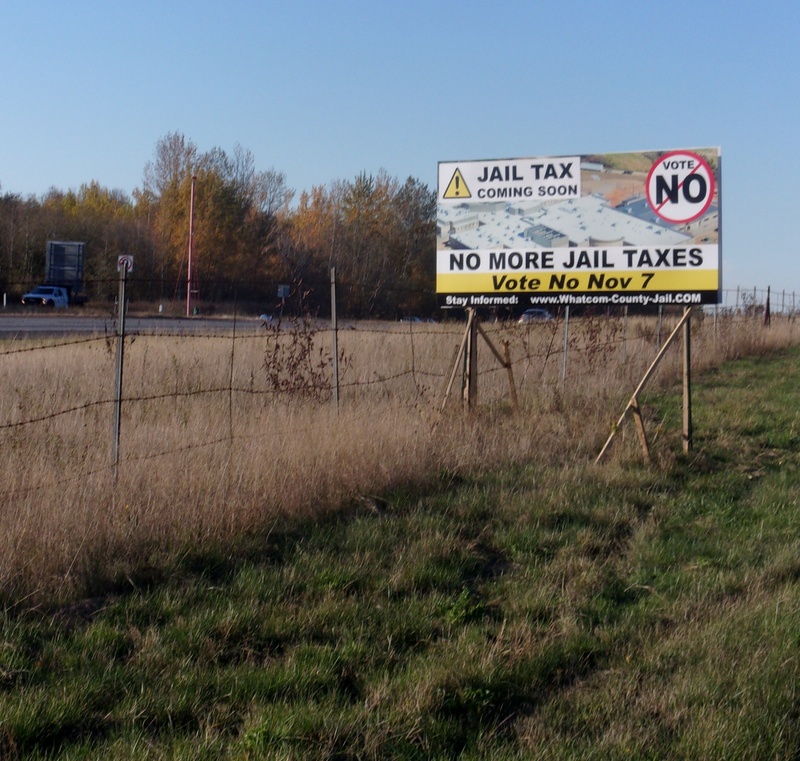 Raising the sales tax to build a large jail off Slater Road seems like a bad idea. We do need a better jail, in Whatcom County, but there are better ideas. Vote on many local issues Nov. 7th 2017. As for the jail, I've commented on the irony that the tax would max out our county's taxing authority for many years due to a state imposed tax limit resulting from (I think) I-601. That state wide initiative passes a few years back putting a limit on taxing authority. This jail is a big ticket item. Some folks in law enforcement have worried that hitting that tax lid could jeopardize funding for other needs that could come up; like new fire stations. That was a big concern in 2015, at least, when a similar proposal was on the ballot. Quite a few liberal minded folks think the jail is too much a jail and there needs to be more things like restorative justice in the proposal. Here's a place where concern about taxation and liberal politics come together. This vote may be a hard choice for some people as our current jail is inadequate. We do need improvement there, but there are other ideas. Among the other ideas is building a somewhat smaller jail expansion on land already owned by the county in downtown Bellingham. It's near the courthouse. Easier access than the proposed Slater Road site. There is a lot of thinking out there on this difficult problem. Various alternative proposals and so forth. I'm happy, but also a bit troubled to report that the Whatcom County jail tax failed again. I voted against the jail tax. The reason I say a bit troubled also is that we do need a new jail. Just a better plan and I would say a more equitable tax if possible; like making part of the tax a property tax rather than having it totally reliant on regressive sales taxes. Of course a lot of what's wrong with our taxes is that we are a sales tax state with no income tax. As we do need to improve the jail, from what I can gather, we will, somehow, have to find enough consensus among our citizens for some kind of plan. That is difficult in this day and age. I wish us the best of luck, but I am glad the jail tax was defeated. Glad with a bit of reservation. I think the vote outcome was an interesting coalescing of what is normally thought of as "conservative" opinion against taxes and liberal opinion for alternatives to incarceration.